Feather flags vs Swooper Flags - Windless banner flags always win! Many clients asks about the difference between the two style flags that we carry. When comparing Feather Flags vs Swooper Flags, the windless banner style feather flag is usually always chosen. Look at the image below, it is clear to see why the full sleeve design reigns supreme. Regardless of having wind or not, your flag is always open. This means your message is always visible! Why purchase a flag that will not display your brand or promotion all the time? The full sleeve flags also wave and flutter in the wind to capture attention. 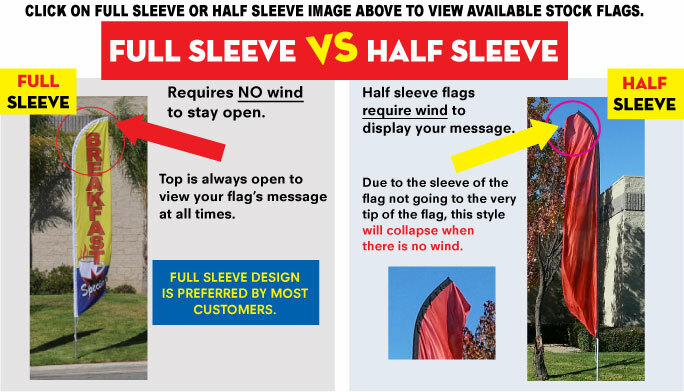 The half sleeve swooper flag waves from top to bottom, but if there is no wind, the flag will collapse. It is great for solid colored swooper flags, since they have no message. But, if you have text on your flag, then the full sleeve feather flag is the way to go. Feather Flags vs Swooper Flags comparison image. Windless banner style feather flags are the number 1 choice! More examples of why swooper flags are bad. Below you will find two images from the LA County Fair. You can see how the half sleeve swooper flags are bad! Especially for indoor use. Feather Banner Flags do not have this problem. They will always be open to display your message. Indoors or outdoors, the feather flags are the best option. 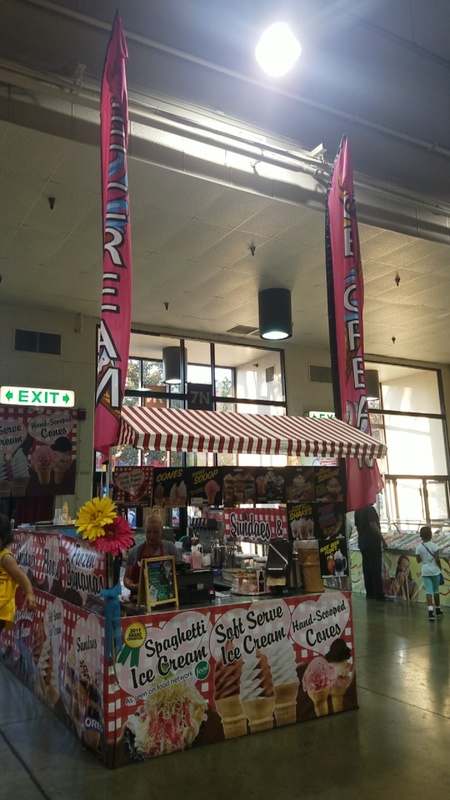 This ice cream booth was located at the end of the LA County Fair’s building. From a distance, I could not even tell what the vendor was selling. 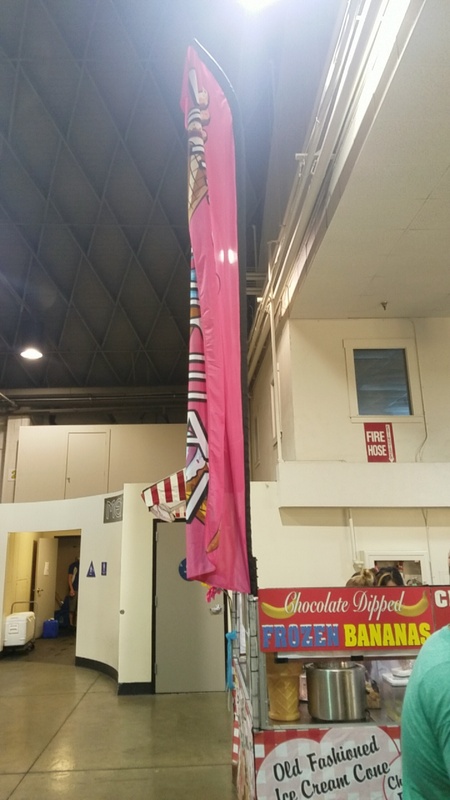 If the vendor purchase a full sleeve feather flag, then the “Ice Cream” text would be visible from the other side. It was a very hot day also and my family was looking for ice cream. We ended up getting a cold drink instead because we didn’t know of the ice cream stand. Image of a half sleeve swooper flag. Why waste money on this? Side angle of a swooper flag. The text cannot be read! As a summary, our patented feather flag design is better than the standard swooper flag. It requires no wind to display your message. The flag can be used indoors and outdoors with ease. Feather flags vs Swooper flags is an easy and quick debate. Always go with Feather Flag Nation’s feather flag. If you are set on the the half sleeve flutter flags then only go with the solid colors. For branding and slogans, only go with the full sleeve flags. Example of a full sleeve feather flag that is always open and easily visible from a distance. Visit or stock feather flags by clicking here. Visit our custom feather flags page by clicking here. I will be posting more images of my LA County Fair Trip. It was very hot but lots of fun! 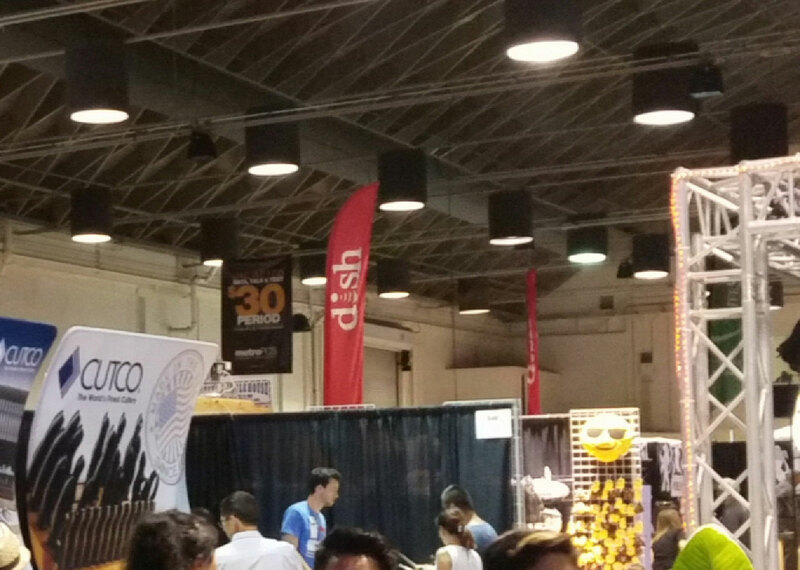 Saw our banner stands, rectangle flags, and feather flags at several booths and events!